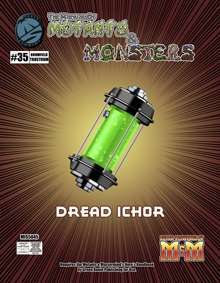 This release of The Manual of Mutants & Monsters provides game stats on the Dread Ichor, an incomprehensible ooze that seems to be the manifest essence of evil itself. Able to possess living hosts to get about, slowly rotting them from within, this foul entity is difficult to understand, stop, or contain. Some believe it may even be the source of all evil, or the blood or other remnants of a dead god! Includes the dread ichor game statistics, typical statistics for a containment canister, and three caper ideas for using this force for Darkness in your game. Also included is a new extra and new flaw. The new flaw will also appear in Better Mousetrap 3e upon its release and the extra will be included in Metahuman Martial Arts 3e.